In 2017, I was asked to view Boston’s MFA exhibit, “Showdown: Kuniyoshi vs Kunisada”, create a work inspired by seeing the show, and then do a demonstration of my process. 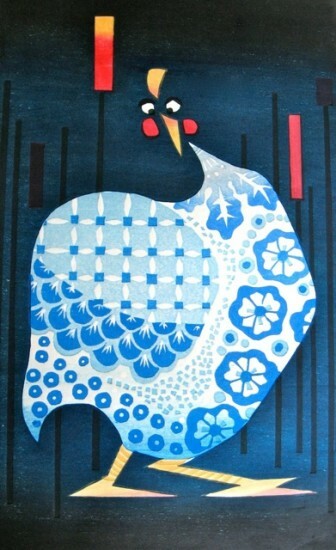 The result was a triptych of three hens, the main influence being from Kunisada’s work, “Fashionable Firefly-Hunting”. “Kabuki Hen” is the first of my three guinea hens. Just as many Kabuki players adorned their kimonos with their family crest, the Shimizu Family Crest appears on the chest of this crazy bird.